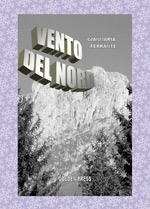 This intense and weighty volume of Grammaria Ferrante's poetry, North Wind has emotions and structural narrative of extraordinary insight expressed in a style completely under the poet's control in the smallest expressive detail. The pace is continuous, like a tireless, decisive forward movement which vibrates in even the smallest parts that give unity to the words. There is no need to emphasize the form or power of the writing because each verse is the word and each word verse. The reading experience never moves forward in snatches, never complacently rests in the happy discovery of symbols but slips off with the aura of a tale, occasionally interrupted but then taken up again and reaching a determinate conclusion. The arrangement of the collection in three distinct sections is very different from a mere listing of the parts: the three sections The Silver Mirror, My Valley and A Pathway draw three different positions, three specific atmospheres and probably three moods of the spirit and the faculty of observation that delineate particular and wholly autonomous characteristics. The first section rushes forward as an agile and many-stranded composition, and is the most restless and disturbing of the three. It is pervaded by a freezing atmosphere and enriched by amazing details carefully observed using a web of symbols, interior and universal references, dream-like situations and dimensions of thought and nightmare, vertiginous and full of pathos, and absorbs an enormous amount of strong emotions which give real stomach punches because of the vividness of the photograms they are composed of. Ferrante's exquisite poetic gift rests on an imposing architecture of refined alliteration that resounds in a fugue of consonants, a jumble of shrieks, semantic sizzling and attrition. What comes out of this is the fascinatingly dark atmosphere of the “silver mirror,” time’s border, the sign for every feasible story that links before and after without too many illusions about a possible positive progression. The scenario is, in fact, knowingly lugubrious and has a compactness that is almost maniacal because it insists on the pitiless observation of reversals of any action that is pushed to the extremes of its existential consequences. It’s a gesture silhouetted throughout in the cold of the absolute and is strong in the punctual presence of realistic horror which at times arrives unexpectedly using cold masks that are fiercely aware of their own alienating effect. On the other hand it lets us see, even in the veil of the metaphorical and metamorphic overlapping, a meeting of generations, a place – mental and not physical – where time has more faces and tends to offer the most ghastly, most piquant and cruel angle on its vision of reality: the confrontation of past and future which mockingly leaves to both the mark of being the victor. Consider, for example, 'The Figure-of-Fun of an Ancient Edict' when it erupts on the scene presenting itself as the clumsy yet exhilarating standard bearer of Nothingness, having a piggy-back on a ridiculous mount (a donkey, and what's more, broken-winded, so the negation of any of the mythical values of a knight). But it's above all the objects that are strewn about the verse-words that imprint the breathing space of the reading with the most horrific images: the calf with its throat slashed, the iron mask, the stones of the wall, the wayfarers, the knights and their horses: they are timeless figures emerging from the past, marmoreal groupings with their evanescent statuesque weight. And then – the violence, blood, rapes. The moments of the poet's ecstatic abandonment are very rare and are brought about above all by the female presences and by being spellbound by the landscape (in this case Le Murge) that shines and triumphs. There we see sporadic anticipations of the openings contained in the following sections which seem to send the reader back to them in a silent and allusive way and without losing the rhythm of the host of haunting, agonised presences, vague beings in a dusty chiaroscuro, and psychic appearances. The section entitled My Valley brings to the surface from hidden recesses a personal relationship with Nature, in particular that of the Alta Val Seriana and the foothills of the Orobia. There we find mythical memories of a childhood that attributes dreamy and mysterious yet vigorous values to a whole series of exclusive links to the landscape and the figures that inhabit it. The animals themselves take on a deep significance and enrich the wonderful gathering of symbolic characters, places, nooks, rocks and mountain paths. A Pathway shines the ray of observation over predominantly marine and rural scenes that are clearer in the choice of colours and certainly are more relaxing in subject matter although the robust tension of the verse, which continues in the initial style for the entire work, never fails. The concluding part of the work is given over to great songs of love, with some indulgence in Romantic lyricism but still taut in the affirmation of an inevitable complexity which can be attributed to the journey completed by two entwined spirits moving through the clashes of life, the movements of history, the fathoming of the past and the many former possibilities which can be referred to. In the final part the brusqueness that opened Ferrante's excellent volume of poetry with its veiled references, already seen in the precise modelling of the three parts to the divisions of Dante's Divine Comedy, dissolves, and the work comes to a joyous conclusion.